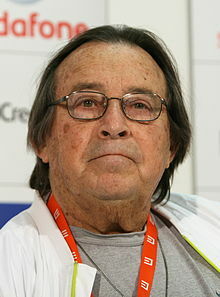 Irwin Lawrence "Paul" Mazursky (April 25, 1930 – June 30, 2014) was an American film director, screenwriter, and actor. Known for his dramatic comedies that often dealt with modern social issues, he was nominated for five Academy Awards: three times for Best Original Screenplay, once for Best Adapted Screenplay, and once for Best Picture for An Unmarried Woman (1978). His other films include Bob & Carol & Ted & Alice (1969), Blume in Love (1973), Harry and Tonto (1974), Moscow on the Hudson (1984), and Down and Out in Beverly Hills (1986). He was born in to a Jewish family in Brooklyn, New York, the son of Jean (née Gerson), a piano player for dance classes, and David Mazursky, a laborer. Mazursky's grandfather was an immigrant from Ukraine. Mazursky graduated from Brooklyn College in 1951. He was an atheist. Mazursky began his film career as an actor in Stanley Kubrick's first feature, Fear and Desire (1953). Kubrick asked for verification of his name for the credits and at that point he decided on a first-name change to Paul. Two years later he appeared in a featured position as one of a classroom of teenagers with issues towards authority in The Blackboard Jungle (1955). His acting career continued for several decades, starting with parts in episodes of television series such as The Twilight Zone and The Rifleman. Mazursky appeared in supporting roles or cameos in most of his own films. In Moon over Parador (1988), with the Rio Opera House available for only three days of shooting, Mazursky cast himself as a dictator's mother when Judith Malina was unavailable, playing the character in drag. Mazursky also played supporting roles in The Other Side of the Wind (1972; finished 2015), A Star Is Born (1976), History of the World Part I (1981), Into the Night (1985), Punchline (1988), Man Trouble (1992), Carlito's Way (1993), Love Affair (1994), 2 Days in the Valley (1996), Miami Rhapsody (1995), Crazy in Alabama (1999), and I Want Someone to Eat Cheese With (2006). He also performed the voice of the Psychologist in Antz (1998). In later years, Mazursky had a small part as "Sunshine" the poker dealer in The Sopranos. He also appeared in five episodes of season 4 of Curb Your Enthusiasm as Mel Brooks' associate Norm, a role that he later reprised in a season 7 episode. Soon after starting his acting career, Mazursky became a writer and worked on The Danny Kaye Show in 1963. In 1965, he collaborated with Larry Tucker in crafting the script of the original pilot of The Monkees television series, in which they both also appeared in cameos. Mazursky's debut as a film screenplay writer was the Peter Sellers comedy I Love You, Alice B. Toklas (1968). The following year he directed his first film Bob & Carol & Ted & Alice (produced and written by Mazursky and Larry Tucker), which proved to be a major critical and commercial success. The film was the fifth highest grossing of the year and earned Mazursky his first Oscar nomination. His career behind the camera continued for the next two decades as he wrote and directed a prolific string of quirky, dramatic and critically popular films. His most successful films were contemporary dramatic comedies and include the Academy Award-winning Harry and Tonto (1974), the Best Picture-nominated An Unmarried Woman (1978), and popular hits such as Moscow on the Hudson (1984) and Down and Out in Beverly Hills (1986). In light of his comedies that tackled a number of modern social subjects, The Hollywood Reporter has stated that "from the late '60s through the '80s, [he] seemed to channel the zeitgeist..." and Variety has stated that "his oeuvre smacks of cultural significance." Other films made by Mazursky during this time include the Hollywood satire Alex in Wonderland (1970), the cutting Los Angeles relationship comedy Blume in Love (1973), the semi-autobiographical coming of age story Next Stop, Greenwich Village (1976), the New York City-based Jules and Jim homage Willie & Phil (1980), the contemporary Shakespeare comedy Tempest (1982), the Caribbean-set political farce Moon over Parador (1988), and the acclaimed Isaac Bashevis Singer adaptation Enemies, a Love Story (1989). Film critic Roger Ebert was a particular fan of Mazursky's work, giving six of his films the optimal four stars in his reviews. In 1986, Ebert stated that "Mazursky has a way of making comedies that are more intelligent and relevant than most of the serious films around." Mazursky experienced less success in the 1990s, beginning with Scenes from a Mall (1991), starring Woody Allen and Bette Midler. Following his filmmaking satire The Pickle (1993), which was his last writing credit, Mazursky worked only sporadically as a director on such films as Faithful (1996), Winchell (1998), and Coast to Coast (2003). His final film was the independent documentary Yippee (2006). In his autobiography Show Me the Magic (1999), Mazursky recounts his experiences in filmmaking and with several well-known screen personalities including Peter Sellers. Mazursky appeared as himself in a number of documentaries on film, including A Decade Under the Influence, New York at the Movies and Screenwriters: Words Into Image. Late in his life, Mazursky was developing a Broadway musical adaptation of his 1988 film Moon Over Parador. From 2011 until his death in 2014, Mazursky served as a film critic for Vanity Fair. Mazursky received five Academy Award nominations, four for his screenplay writing on Bob & Carol & Ted & Alice (1969), Harry and Tonto (1974), An Unmarried Woman (1978) and Enemies, a Love Story (1989), and once as producer of An Unmarried Woman (nominated for Best Picture). He was also twice nominated for a Golden Globe and twice for the Cannes Film Festival's Palm d'Or, among many other awards. In 2000, he was the recipient of the Austin Film Festival's Distinguished Screenwriter Award. In 2010, the Los Angeles Film Critics Association honored him with an award for Career Achievement. On December 13, 2013, Mazursky was awarded the 2,515th star of the Hollywood Walk of Fame, in front of Musso & Frank Grill. Friends and collaborators Mel Brooks, Richard Dreyfuss, and Jeff Garlin were all present. On February 1, 2014, at the WGA Awards, Mazursky received the Screen Laurel Award, which is the lifetime achievement award of the Writers Guild of America. Comedian, filmmaker and close friend Mel Brooks presented the award. In 2015, Joe Swanberg's film Digging for Fire was dedicated in memory to Mazursky. Greg Pritikin dedicates his 2019 film The Last Laugh to Mazursky. Paul Mazursky went into cardiopulmonary arrest and died on June 30, 2014, aged 84, at Cedars-Sinai Medical Center in Los Angeles. ^ "Paul Mazursky Biography (1930-)". Filmreference.com. Retrieved 2014-07-10. ^ Farber, Stephen (2006-12-31). "A Night in Hollywood, a Day in Ukraine". The New York Times. Retrieved 2006-12-30. ^ Farber, Stephen (2006-12-31). "A Night in Hollywood, a Day in Ukraine". The New York Times. Retrieved 2006-12-31. I’ve always felt very Jewish but very ambivalent about being Jewish. I’m an atheist. ^ a b Natale, Richard (1 July 2014). "Paul Mazursky, Director of 'Unmarried Woman,' Dies at 84". Variety. Penske Business Media, LLC. Retrieved 10 July 2014. ^ "Paul Mazursky's Bio at NNDB". Nndb.com. Retrieved 2014-07-10. ^ "Paul Mazursky: How the WGA Awards Honoree Captured the Culture". Hollywood Reporter. Retrieved February 19, 2014. ^ "Mazursky and Actors: A Love Story". Variety. Retrieved February 19, 2014. ^ Emerson, Jim. "Roger Ebert on Mazursky". Rogerebert.com. Retrieved 2014-07-10. ^ Ebert, Roger (1986-01-31). "Roger Ebert Review of ''Down and Out in Beverly Hills''". Rogerebert.com. Retrieved 2014-07-10. ^ Thompson, Anne. "RIP Paul Mazursky, Brilliant Hollywood Writer-Director". Indiewire.com. Retrieved 2014-11-22. ^ Mazursky, Paul. "Paul Mazursky in Vanity Fair". Vanityfair.com. Retrieved 2014-07-10. ^ Ruymen, Jim. "Paul Mazursky honored with star on the Hollywood Walk of Fame in Los Angeles". United Press International. ^ Walsh, Katie. "Interview: Joe Swanberg Talks Personal Filmmaking, Paul Mazursky, And The Inspiration Of 'Friday Night Lights'". Indiewire. ^ Woo, Elaine (1 July 2014). "Paul Mazursky dies at 84; director chronicled trends of '60s and '70s". Latimes.com. Retrieved 10 July 2014.